Home / NITRO License / How to convert the Crow Canyon NITRO Trial license to Subscription/Enterprise license? How to convert the Crow Canyon NITRO Trial license to Subscription/Enterprise license? This article describes the process to convert the trial license to Subscription/Enterprise license. When we install the NITRO Studio initially it comes with default 30 days trial license. Contact Crow Canyon Software (sales@crowcanyon.com) to get the subscription/enterprise license and more details about license validity and other details. For example, assuming that we have applied the NITRO Studio to a sub site in the site collection before purchasing the subscription/enterprise and now we would like to convert the trial license to subscription/enterprise for that sub site. Please follow the below three steps process to apply the subscription/enterprise license. 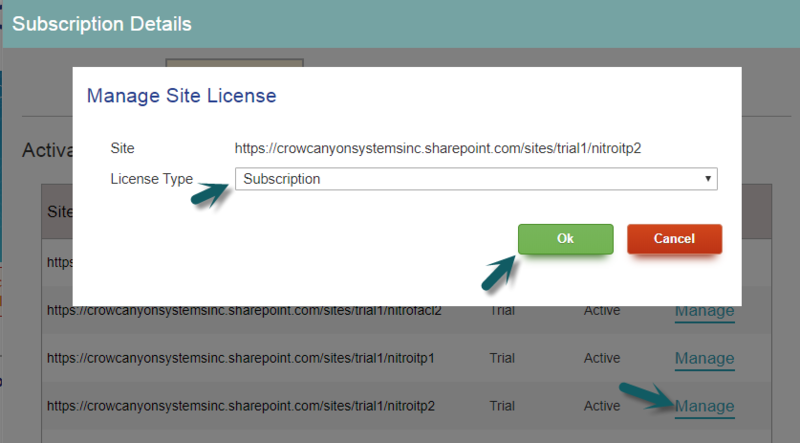 For SharePoint Online: Go to root site of the site collection –> site contents –> open the “Crow Canyon NITRO Studio” app. 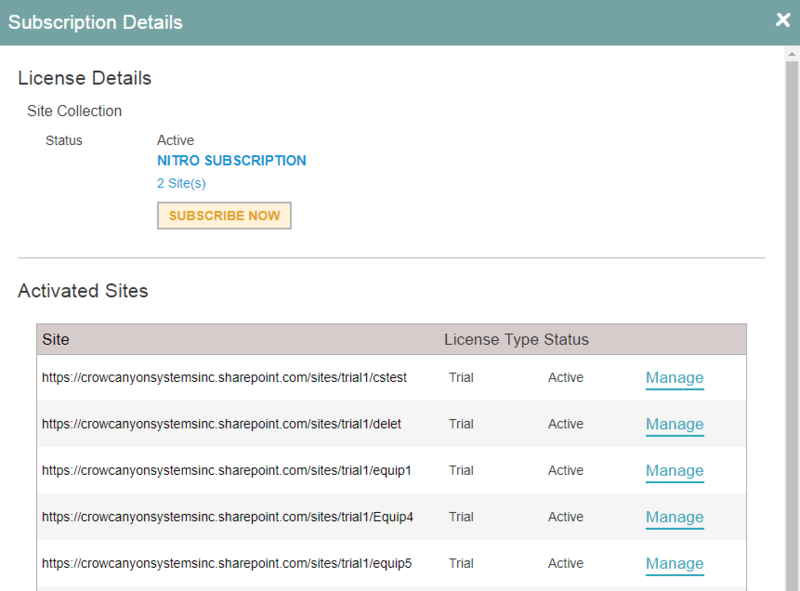 It opens the NITRO Studio Admin Center and shows the subscription/enterprise license status on the right side of the page as shown below. 2. Click on “Subscription Details” button, it opens a dialog and shows all the current sub sites in that site collection that have the NITRO activated as shown below. 3. Click on “Manage” button for the sub site that we wish to apply the new subscription/enterprise license. It opens a dialog and shows the site, license type. 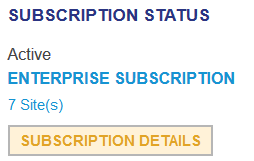 Make sure that site is correct and license type is “Subscription/Enterprise” and click “OK” as shown below. Once the “Subscription/Enterprise” license is applied, the “License Type” will be changed to “Subscription/Enterprise” from “Trial” as show below. How to convert the Crow Canyon Power Portal Trial license to Subscription/Enterprise license?